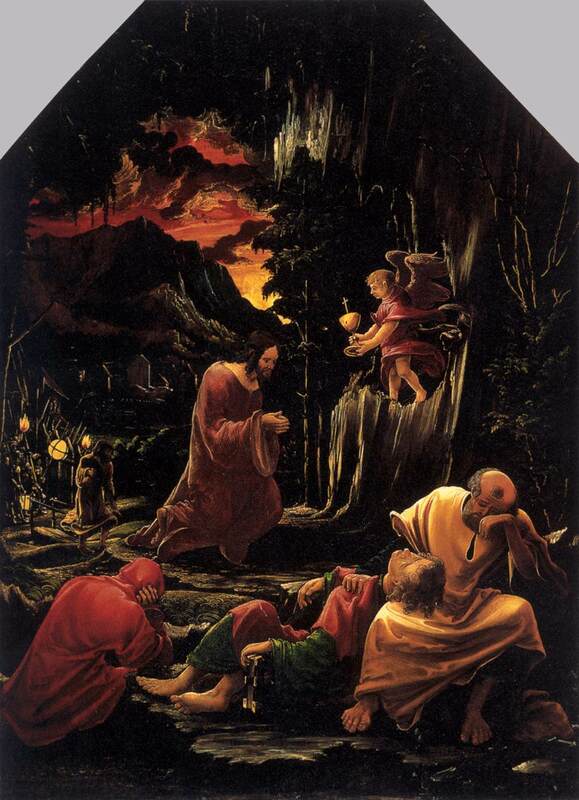 MEDITATIONS ON THE PASSION: How Christ Our Lord Went To The Garden Of Gethsemane. How Christ our Lord went to the garden of Gethsemane. When Jesus had said these things, he went forth with his Disciples, & having passed the torrent of Cedron, he went according to his custom towards mount Olivet, & coming with them into a village called Gethsemane where was a Garden, he entered into the same together with his Disciples, to whom he said: sit you here until I go yonder and pray. And taking to him Peter and the two sons of Zebedee James and John: he began to be sad and to fear, saying to them: my soul is sorrowful even unto death: stay here and watch with me. And being pulled away from them, and gone forward a little about a stones cast: he knelled down, and fell flat on his face upon the ground. Josophat King of Juda, understanding that the Moabites, & Amonites came with a great army against him, being full of fear and terrors prostrated himself in prayer before our Lord, praying him to deliver him from the hands of his enemies. 1. Cor meum conturbatum est in me, & formido mortis cecidit super me. My hart os troubled within me, and the fear of death is come upon me. 2. Repleta est mais, anima mea, & vita mea inferno appropinquavit. My soul is filled with evils, and my life is come nigh unto death. 1. See my soul how thy Jesus goeth voluntarily, in manner of a most meek lamb unto sacrifice, and how the Disciples go after him full of fear, weeping & sighing: where thou maist consider, with what sweet speeches our Lord exhorted and comforted them whilst they were thus walking. O how hard a thing seemed it unto the pious Disciples, to be separated from their most loving master, & how bitter tears did they shed: And he likewise as a most benign Pastor, seeing his sheep so sorrowful for his love, could not contain himself from weeping. Approach thou also my soul, and seeing that thou canst do no more, at least with sighing and tears accompany thy Lord, which for thy sake goeth unto death. 2. Consider with how great desire and promptness out Lord went towards the Garden, to set a beginning to that work which he so much desired, of our redemption. He went to the Garden to the end that where the first man by his disobedience, lost his liberty, in the self same place he by his obedience might restore it. In the garden the world sickened: In the Garden Christ gave a beginning pf the health thereof. Our Savior therefore both went and also was driven forward and carried: He went, because that willingly he did go to his death: Oblatus set, quia ipse voluit: He was offered to death (saith the Prophet) because he would. And as he went of his own accord, even so he gave his enemies all opportunity that they might find him, and have him in their hands. Our Lord also was driven on the one side forward and carried by the obedience of his Father, which he signified in those words when as supper being ended, he said to his Disciples: to the extent the world may know that I love my father, & do that which he hath appointed me: arise up and let us go from hence: on the other side his exceeding charity towards us did drive him: whereof he had spoken a little before unto his Disciples, saying: greater love then this no man hath, that a man yield his life for his Friends. Yea far greater (O my Lord) was your charity for that you gave your life not only only for your friends, but also for your enemies. This chairty was that which not only proved him willingly to suffer death, but also in the whole course of his life afflicted him, thorough the earnest desire which he had to see this hour once present, even as he expressed in those words. Baptismo autem habeo baptizari, & quomodo coarctor, usque dum perficiatur. But I have to be baptized with a baptism, & how am I straitened until it be dispatched. 3. Whilst our Savior was thus going he began to give signs of fear and sadness, saying: my soul is afflicted unto death. Have compassion O my soul of thy afflicted Jesus, see how that divine face is all changed and appalled: & how for greatness of the grief which oppresseth his heart he is scarce able to bring forth his words: O strength of the Father, O Joy of the Angels, why do you fear, & for what cause are you sad, do you peradventure fear death? but for what other end came you into the world, and took that most wholesome name, but by your death to destroy or death? And if you good Jesu do fly from death, what shall become of me, and who can ever be able to satisfy for my sins? You a little before showed great desire of death, and solicited the traitor that speedily he should dispatch: and now it seemeth that you fly, and retire: But verily (my Lord) this fear and this sadness was not yours but ours, even as the force and strength which we have in the travails of this life, is not ours but yours. You did constraint yourself of that part which you held of our nature, and we are made strong by the force of your Godhead. You like the true Adam gave the Church your spouse a rib of your strength, and took of her in lieu of it the flesh of our weakness. 4. Consider moreover how great was this affliction of our Lord, seeing that he not only sorrowed for the loss of his own life, but also for all the sins of the world, taking upon himself all such pain & grief as was due to the sins of all men. Wherefore he well said that he was afflicted until death, for so great this sorrow, that it alone was able to cause him to die. Truly (O Lord) your contrition and sorrow was great in manner of the Sea, for that great was also our wound: and great was your love which moved you to take for the same such great sorrow. 5. Presently as our Lord came to the place of prayer, all afflicted he fell flat on the ground. Where thou maist well consider the weight of thy sins and offenses, seeing that our Lord taking them on his shoulders, was enforced by the huge burden thereof, to bow & incline himself unto the earth. And see likewise, how high the pride had halted itself, for that to make satisfaction therefore unto the divine justice, it was needful that the most high God should abase himself so much, as to lay his divine face on the ground. O good Jesu, sweet lover of men, what pain and travail do you take to make us worthy of Heavenly consolation? How profoundly do you humble yourself to exalt us? and how much greater account do you show to make of our feet, then of your divine head? seeing that a little before you would have your Disciples set their feet on your bosom whereupon the Angels most happily repose themselves: and you now lying prostrate on the earth, do put your sacred head, where men do set their feet. Thou shalt pray unto Christ our Lord, seeing that for thy sins he would be sad, & for thy infirmity become frail & weak: to give the grace to beare stoutly and willingly for his love, all the pains and tribulations, which he shall permit for to happen unto thee, and likewise that he will communicate unto thy heart, some little portion of that his amorous affection, that thou maist likewise, be sorrowful and take compassion, on the travails and sadness which he felt for thee, and moreover be companionable over the infirmities and necessities of thy neighbors and brethren. 1. The servants of God ought not to despair, though sometime in their temptations they be assaulted with fear or pusillanimity, seeing that Christ our Redeemer, would also himself for our example sustain fear and sadness. 2. Christ our Lord was not sad so much for his Passion which he most ardently desired, as for our cause: wherefore we must likewise for his imitation, take pity and be sad at the loss and spiritual necessity of our neighbors. 3. If Christ would for our love, feel such sadness and affliction without any consolation: we must also for his love, and for our salvation despise the pleasures & vain consolations of this world. 4. If we will devoutly pray, we must enter into the desert of our heart, ridding our mind from all terrine affections and withdrawing ourselves from over much conversing even with our dear friends, as Christ withdrew himself from his beloved Disciples. 5. Let us learn by the imitation of Christ, to repress our passions with the bridle of reason, that they arrive not unto our soul, but rest in our sense, under the empire of our will. 6. If sometimes in our works and travails taken in the service of God, we feel some tediousness or sadness, we ought not to loose courage, or think that our travail is in vain, or without merit, but we must comfort ourselves with the example of Christ who in the work of our redemption did feel the like tediousness & fastidiousness and irksomeness. 7. In all our travails or temptations we must make recourse unto Prayer, by the virtue whereof we shall be eased of the burden of them or else shall obtain strength and force more easily to suffer them and to reap fruit by them.